Clutter is overwhelming. Not only is it distracting, but it can actually impede you from being productive. According to Psychology Today, clutter “inhibits creativity and productivity by invading the open spaces that allow most people to think, brain storm [sic], and problem solve.” Think about it this way: clear space, clear mind. 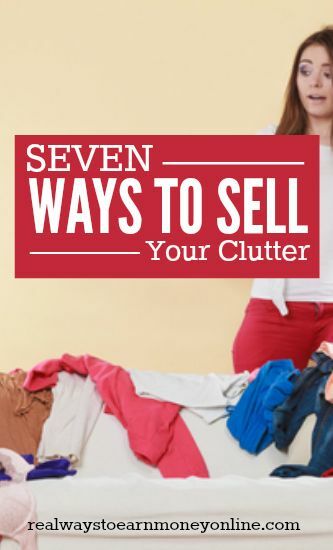 Plus, if you clear the clutter, you’re just making more to buy new, fun, exciting things that can better serve you. Donating and getting rid of old items can also be a major tax write-off. The above are but a few good reasons to declutter your life – and here’s one more: these days, there are several amazing websites and apps that aid in helping you to sell your old stuff online. Luckily for you, we easily broke it down into our top seven free (or practically free) websites and apps that you can use to sell your items – read on to find out how to turn your garbage into gold. Letgo has one of the best features on any website, in our opinions: the ability to simply “log in” using social media. Who wants to suffer through a long sign-up process when you have stuff to sell? Once you’re logged in, simply click on the “Sell Your Stuff” icon and get going! Letgo lets you let go of old movies, clothing, furniture, electronics – even cars. It is very similar to many other sell-your-junk websites, though the app doesn’t process payments, and recommends that you meet in-person with your buyer. One of the coolest features regarding Letgo is that it lets you negotiate with your buyers via chat inside the app. Another neat feature is that you can mark your items as “sold” within the app, similar to what you would do on Facebook marketplace when an item sells. Keep in mind that the app is new, so it does still have a few kinks to work out, i.e., spam buyers. It is difficult to get away from scammers with any selling service, so be wary about who you’re selling to and what information you’re putting out there. The app is location-based, so you will be selling items in your area. Another key issue is that the app is not popular in smaller towns, so may not work well for some readers. Check out the app here at the Apple store (it's also available for Android) and download on your smartphone if it works for you. With a five-star Trustpilot rating, Decluttr is a seller’s app that clearly comes highly recommended. This app is unique, because you can only sell items with a barcode – so, CDs, DVDs, books, games, and tech. You enter an item’s barcode and/or number for a “tech” item, and the app will immediately provide an offer. If it looks good to you, pack your items in a box, ship it to Decluttr for free, and get paid via check, PayPal, direct deposit. Additionally, you have the option to donate your “order value” to a charity. There are not paying fees for listing your items, and for shipping, all you have to do is attach a free shipping service label to your box and ship it from a UPS center – how simple is that? For more information, visit the Decluttr website to get started in shipping off your tech and pocketing some cash. If it ain’t broke, don’t fix it – sell it! eBay is a tried-and-true method of clearing your clutter, and comes highly recommended and trusted. Dubbed “the world’s online marketplace,” sellers can sell from virtually anywhere in the world, and the same goes for buyers. Nearly anything you sell on eBay will be bought, as long as you’re flexible – that’s the beauty of the site. Founded in 1995, eBay has truly lived up to its reputation, and is the largest online community to buy and sell, boasting hundreds of millions of users buying normal, everyday items, to the very weird – like, celebrity hair trimmings and haunted dolls. However, eBay is one of the more complicated websites to use; you should really do your research before deciding whether or not to use the website (and you started in a good spot by reading this article!). After creating your seller’s account and setting up a payment method (we recommend using PayPal), build your rep by purchasing a few small items. You’ll start getting good reviews, especially if there are no communication or payment issues. Another good trick is to only sell a few items and sell what you already own – you are minimizing risk in this way. Also keep in mind what market you are selling to – look at other listings to see what similar sellers are doing right and wrong. Are you a beauty fiend with a penchant for pretty? Do you frequently buy makeup you end up never using? Then GlamBot may be the perfect sellers’ platform for you! The company will purchase your new or “unloved” makeup by mailing you an offer within five business days from when they receive your package of goodies from USPS. Bear in mind that you must review the sell requirements and accepted brands first, so that you don’t waste their time or yours! If all bodes well, request that GlamBot email you a free shipping label. Once you ship your makeup and get that dough, you can spend it on even more beauty products by getting 30% in store credit. That’s right – GlamBot is also a store that you can spend money in; and thus the cycle begins again. One of the website’s coolest features is that you can tell by the brands they accept that they are the virtual It Girls of buying unwanted makeup – indie brands and high-end names abound on their page. To cash in on your makeup habit, visit GlamBot. Poshmark is your go-to high-end fashion find. Buy and sell your old chic looks on this website, and be prepared to rake it in! This is another website where you should look at other seller profiles, and see what is being “liked” (as denoted by a little heart in the bottom corner of the picture) – take notes based off of that. High-end brands are the ones that generally sell, though you can still try and sell a newish Old Navy dress for cheap. One of Poshmark’s most notable features is their Posh Parties, which are virtual shopping parties for buyers and sellers on the app. Skip the trip to the mall and shop online – only do it while bonding with your friends, as opposed to with your cat, in your pj’s, eating three-day-old leftover pizza. In order to sell on Poshmark, you will need to download the app on iPhone, iPad, or Android devices. Want to clear the clutter, but prefer to keep it local? Do you feel like Craigslist can be a bit shady sometimes? Try Bookoo, the new way to sell to your neighbors! It is similar to Craigslist or Letgo, in that you meet up with a seller, exchange money, and off you go. The bonus is that it’s all local, which makes for easy pick-up – especially for big items, like furniture. And, it’s with your neighbors! So, you likely know the folks that are selling the stuff, or have a general idea of what you’re getting and who you’re dealing with. To see if Bookoo is right for you, visit their website. Gone are the days of yard sales (well, almost) – of all the selling is online! Happy selling! Passing this along! Have a great day and rest of the week!